To ensure your full security, Real Site is enabled by default. We recommended you keep Real Site turned on at all times unless you need to temporarily disable it for troubleshooting purposes. 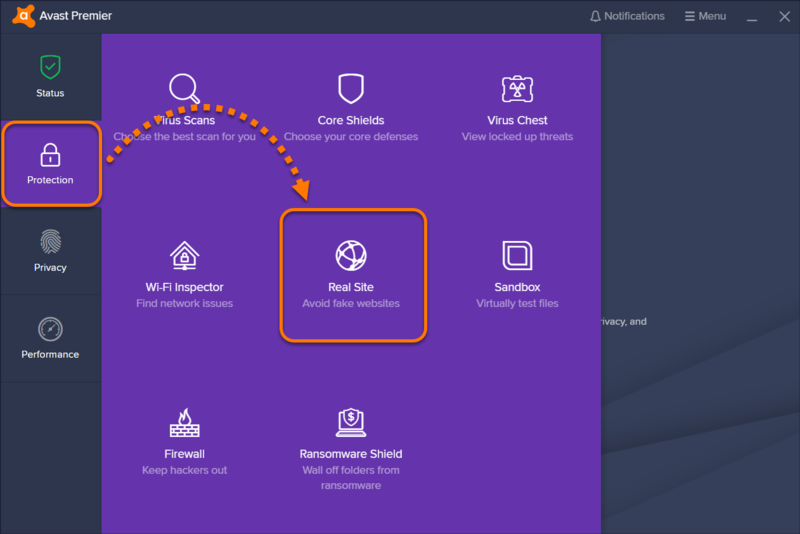 Open the Avast user interface and go to Protection ▸ Real Site. Click the ON slider and select a time duration from the list. Click Yes to confirm that you are disabling Real Site intentionally. Real Site is turned off for the selected time duration and automatically turns on after this time passes. To manually enable Real Site, follow steps 1 and 2 above, changing the slider from OFF to ON. You can also manage Real Site from ☰ Menu ▸ Settings ▸ Protection ▸ Real Site. We recommended you keep Real Site turned on at all times unless you need to temporarily disable it for troubleshooting purposes.